Dr. Tatsuo Nozaki and Dr. Katsuhiko Suzuki, Research and Development (R&D) Center for Submarine Resources, Japan Agency for Marine-Earth Science and Technology (JAMSTEC: Asahiko Taira, President), and Dr. Yasuhiro Kato, School of Engineering, The University of Tokyo, successfully determined the primary formation age of the Hitachi deposit (copper-zinc-lead sulfide deposits classified into volcanogenic massive sulfide*1) in Ibaraki Prefecture. To directly date the constituent sulfide minerals*2 included in sulfide ores, the Rhenium-Osmium (Re-Os) isotope dating method*3 was applied to them and revealed that the primary formation age of the Hitachi VMS deposit is estimated to be the Cambrian (485.4 to 541 million years ago), not Early Carboniferous (323.2 to 358.9 million years ago) as before. The Hitachi VMS deposit is, therefore, classified as the oldest dated ore deposit in Japan. This result supports the ideas of previous studies, indicating that there is a large age gap (hiatus) in the geologic record of 150 million years and a wide distribution of the Cambrian beds in the Hitachi area. It is expected to provide an important age constraints to reconstruct the initial tectonic history of the Japanese Islands. These results have been published in Economic Geology, the Society of Economic Geologists’s online academic journal, on September 1 (Local Time). *1 Volcanogenic massive sulfide: Sedimentary exhalative deposits associated with submarine volcanic rocks and hydrothermal activities. Besshi- and Kuroko-type sulfide deposits widely distributed in the Japanese Islands are classified as one of the volcanogenic massive sulfide deposits. *2 Sulfide minerals: A classification of minerals bonded with sulfur. Main constituent sulfide minerals of the Hitachi deposit are pyrite (FeS2), chalcopyrite (CuFeS2), sphalerite ((Zn,Fe)S), pyrrhotite (Fe1-xS) and galena (PbS). *3 Re-Os isotope dating method: The atomic numbers of Re and Os are 75 and 76 respectively, and Os is one of the platinum group elements. Re has two isotopes (185Re and 187Re) and 187Re is a radioactive isotope which produces 187Os through the β- decay with a half-life of 41.6 billion years. 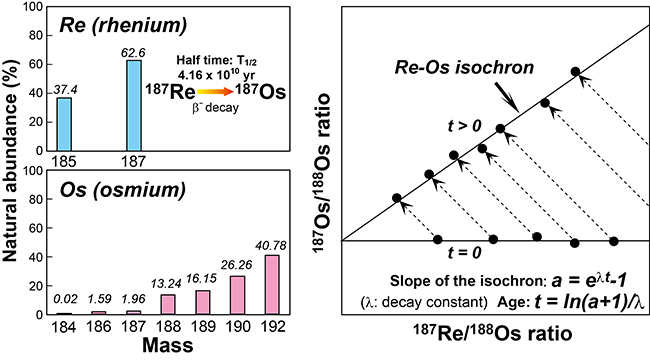 Re-Os age can be determined by the slope of the regression line (isochron) in the 187Re/188Os and 187Os/188Os ratios diagram obtained by isotope analysis. Figure 1: Principles of the Re-Os isotope dating method. Re-Os age can be determined by slope of the Re-Os isochron in the 187Re/188Os and 187Os/188Os ratios diagram. 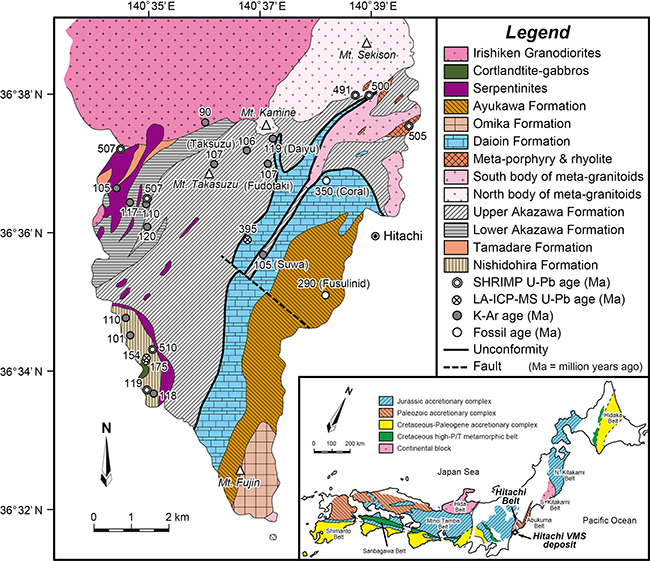 Figure 2: Locality and stratigraphic division maps of the Hitachi VMS deposit, Japan. 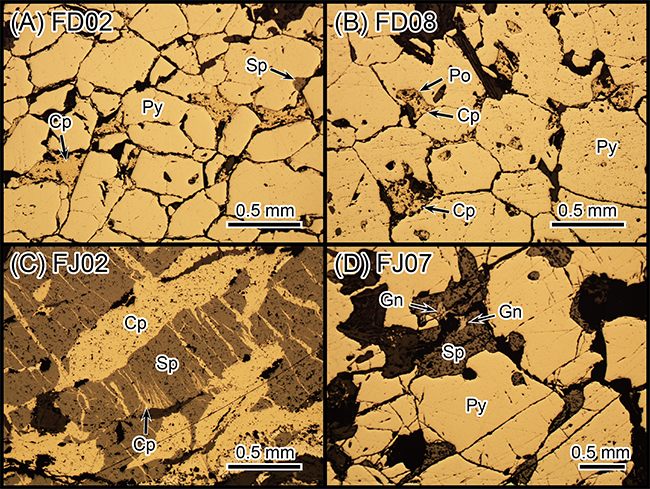 Figure 3: Photomicrographs of Fudotaki and Fujimi sulfide ores under reflected light. These sulfide ores are dominated by pyrite with some amounts of chalcopyrite, sphalerite, pyrrhotite, galena, marcasite and barite. 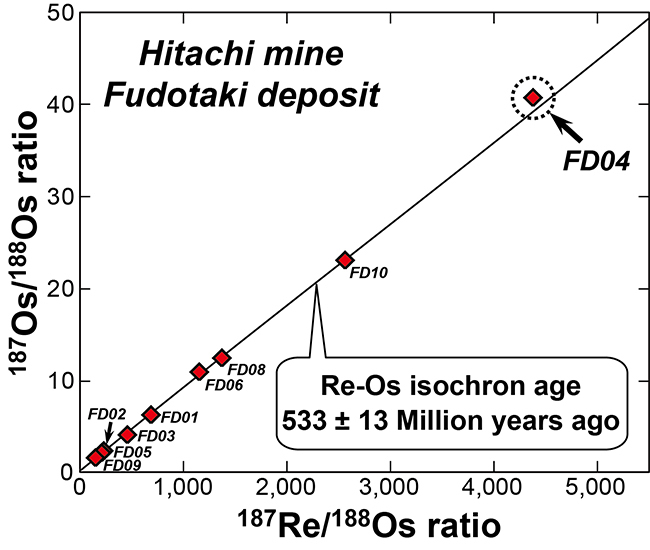 We could not obtain the Re-Os isochron having good linearity from the Fujimi sulfide ores which include much more amounts of sphalerite and pyrrhotite than the Fudotaki sulfide ores. Scale bar is 0.5 mm. Mineral abbreviations: Cp = chalcopyrite, Gln = galena, Po = pyrrhotite, Py = pyrite, Sp = sphalerite. Figure 4: Re-Os isochron diagram for the Fudotaki sulfide ores. We could obtain well-defined Re-Os isochron from the Fudotaki sulfide ores which are dominated by pyrite and chalcopyrite. The Re-Os isochron age was calculated to be 533 million years ago. The most radiogenic sample (FD04) was removed in regression and age calculation.